As an ASQ member and quality professional, you are likely already familiar with many of the resources available on the ASQ.org website. One area you may not have visited recently is the ASQ Career Center. I will highlight some of the resources found in the ASQ Career Center that might be of value to our section members. After logging in and navigating to the ASQ Career Center, go to the Job Seekers area. Of course, the ASQ Career Center offers Job Search functionality that you are familiar with on other career websites. You can click Find a job to look for employment opportunities. Honestly, I’ve never been very impressed with the “quantity” of opportunities that are posted here. 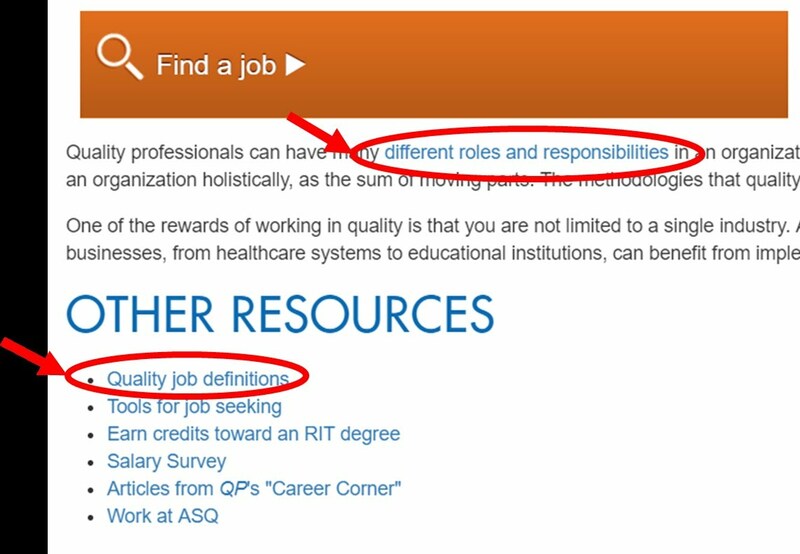 However, the one thing that I’ve hoped for when searching in the ASQ Career Center job postings is that the relatively few employers using this service would be more likely to understand and appreciate the field of quality including the value of ASQ certifications (quality over quantity?). Of more interest to me was the section called OTHER RESOURCES. I found several items in this area that I’d like to bring to our section members attention. I want to focus on the first resource link in this list. There is a link to different roles and responsibilities and one for Quality Job Definitions – these links take you to the same source page for QUALITY JOB TITLES & DEFINITIONS. 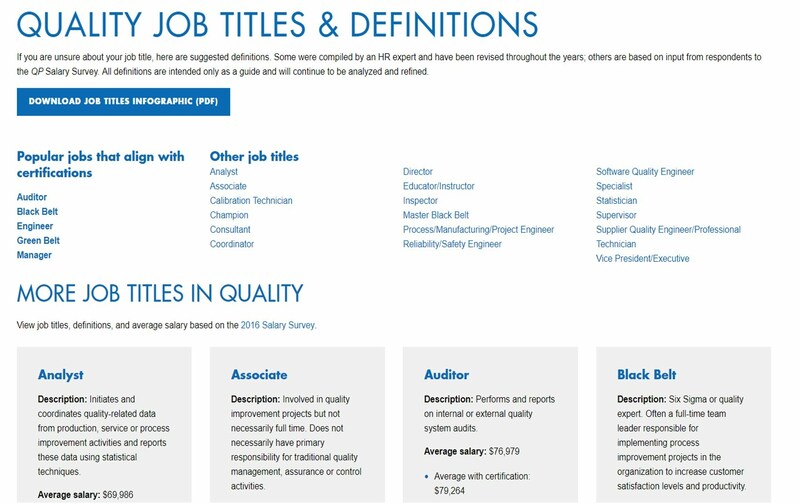 This page summarizes many quality job titles, provides a definition of typical responsibilities for that role, and references the average salary based on ASQ's annual salary survey. How might this information help you? It provides a relative comparison of responsibilities versus average compensation that general industry is paying. The position titles that align with ASQ Certifications also show salary averages with and without certifications. For example, a Quality Manager with a CMQ/OE certification may expect to earn significantly more than one without the certification. Of course, there are many factors that go in to individual salary vs. compensation details including industry type, education, years of experience, location, etc. The key point to make is that quality professionals need to understand the career environment they operate in with supporting data regarding what types of opportunities are paying well and what types of education and experience may be needed to meet position requirements. I highly recommend each quality professional review ASQ’s annual salary survey results that appear in Quality Progress magazine which provides additional details beyond this summary page under OTHER RESOURCES. Here’s a link to the current ASQ Salary Survey that appears in the December issue of Quality Progress. I hope that you found this review at least a helpful reminder to make time to be aware of the latest resources and information available.